The Hospitalist Program at Windham Hospital. When you are admitted to Windham Hospital, your primary care physician may refer you to the care of one of the Hospitalists--staff physicians who oversee admitted patients during their hospital stay. As the name implies, hospitalists see only hospitalized patients, so they are readily available to respond to any changes in your condition, order medical changes or tests, and answer your questions. Once you're discharged, you return to the care of your regular doctor. Hospitalists are physicians who specialize in managing the care of patients while they are in the hospital (inpatient care). It is a new specialty that is growing in the country today. If your doctor chooses to use their services, the hospitalist coordinates consultations, orders tests and procedures, and personally provides the patient with a consistently high level of care throughout the hospital stay. All of the hospitalists at Windham are board-certified internists. If you are admitted to Windham Hospital—either through the Emergency Department or by referral from your primary care physician—the hospitalist will coordinate your plan of care and keep your primary caregiver informed of your condition. This process is similar to what your physician does when he or she refers you to a specialist for another opinion or for additional tests and treatment. The hospitalist and your doctor may talk extensively regarding your treatment. At discharge, the hospitalist will communicate with your doctor to discuss your additional treatment needs, help arrange follow-up care and prescribe the necessary medications. The hospitalist will also send your hospital records to your primary care physician. What services do Hospitalists provide? Hospitalists keep a close eye on you. Your hospitalist works only in the hospital, seeing you as often as necessary to provide you with the best care, and can arrange for immediate tests and assessments. Your hospitalist knows every specialist and department in the hospital, and will assist you through a smooth and speedy recovery process by following up on tests and adjusting your treatment regimen based on those test results. Hospitalists answer your questions. Hospitalists are here to provide answers in person whenever possible. During critical or stressful moments, they provide honest and considerate answers to your questions, and with your permission, give information to your family. 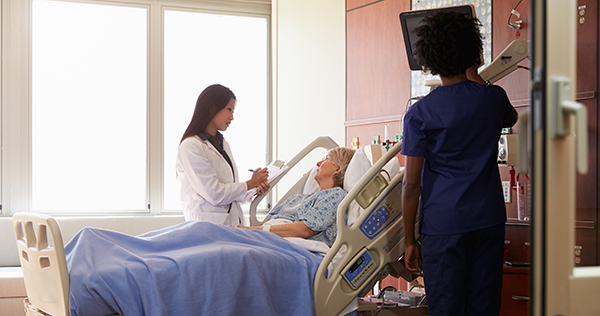 For patients and physicians, working with a hospitalist team is a win-win proposition. Using a hospitalist team enables your primary care physician to be available to you in the office, while the hospitalist remains available to care for you when you are at your sickest. With a physician who practices exclusively in the hospital, it is easier for you and your family to conveniently communicate about your illness. Who are the Windham Hospitalists? The hospitalists are dedicated to providing quality hospitalist services at Windham Hospital. All are Board Certified Physicians.